We summitted on Friday 27th February 2010 after a hairy night camped in the crater following a tough ascent via the snow-clad steep Western Breach slopes and wall. We are a father and son team (Barry and Sachin Dalal-Clayton) who climbed Mts Meru and Kilimanjaro between 19 and 27 February 2010). We followed perhaps the most rewarding and spectacular way up Kilimanjaro, combining an approach across the Shira plateau via the Lemosho route as far as the Lava Tower, and then an ascent via the spectacular Western Breach - with a night camping in the crater. 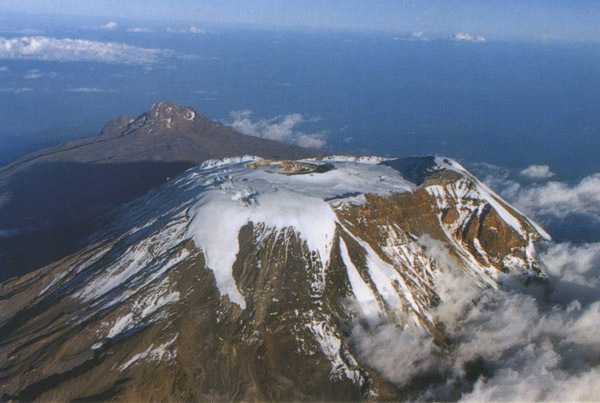 In February, we travelled to Tanzania to climb two Mountains: Meru (14,976 ft) and Kilimanjaro (19,340 ft). This was a challenge to celebrate Barry's 60th year. But we also added some motivation by trying to raise money for two local Tanzanian charities – the Mkombozi Centre for Street Children and the Kilimanjaro Porters Assistance Project. With pride and delight, we can report that we succeeded and managed to summit both mountains. 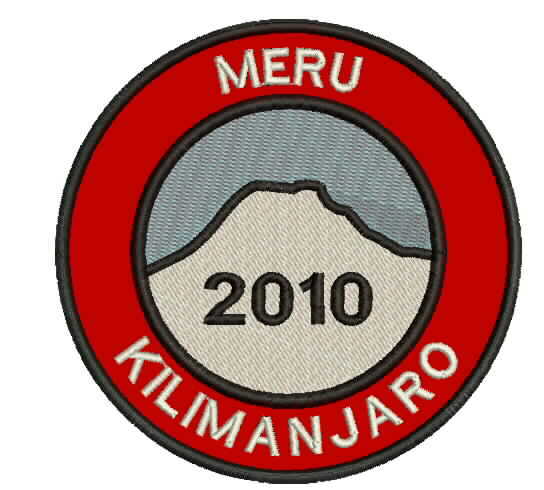 Meru was planned as a warm up climb over four days, but proved to be very tough, especially the last day to the top – exhausting since we went to altitude rather quickly. But it really set us up well for Kilimanjaro, providing valuable acclimatisation. Our climb on Kilimanjaro took nine days. We were a party of eight climbers – joined by three Canadians and three from the USA. In support we had three guides, a stomach engineer (cook) and no less than 24 amazing porters – each carrying about 25 Kg of gear (tents, food, our duffel bags, etc). So we were 36 in all – quite a team. Our route took us through several climatic zones. So we needed layered clothing suitable for dealing with each. We started on the warm and dry savanna plain. Then we trekked up through hot and sticky rain forest for two days, full of elephants , buffaloes, leopards, monkeys and birds. This led to the Shira plateau – a vast extent of moorland at about 12,000 -14,000ft characterised by heather the size of trees (seriously) which took two trekking days to cross. From the start up across the moorland, we had rain showers every day – so it was on and off with the waterproofs. As we got higher we moved into montane desert. Up here it was really freezing cold at night. Then we got to the serious end of the business – the final ascent up the Western Breach up into an arctic zone where temperature can fall to as much as minus 20 degrees C when the winds blow strongly. The Western Breach is a dangerous route not taken by many – most use the easy route on the other side of the mountain up endless zig-zag ash screes. Our route was far steeper with a lot of ice and scrambling up seriously vertical pitches. The route lies beneath glaciers which lip over the crater rim and which are retreating and release rocks when the sun warms up in the morning, At night they are frozen in. We heard the avalanches when we lower down on the mountain. Three Americans were killed in 2006 by falling rocks and the route was closed for two years. Normally the slopes below the glaciers are ice free and we had been told we didn’t need to bring crampons or ice axes. But this year there was a lot of snow and ice. In the UK winter, we would have used crampons and axes, and roped up if the wind was strong. The senior guide only had one axe but this soon broke. So he had difficulty in cutting steps across the ice fields and glaciers. Luckily no-one slipped – that could have been “interesting”. Anyway, we set off from Arrow Glacier Camp (16,000 ft) at 3.30 am and slowly climbed up the ice fields by head torch, and managed to cross the danger zone (where rocks hurtle down) just after sunrise. After that, we were able to tackle the vertical Breach Wall in 'relative' safety. The climb was physically demanding and exhausting, but we finally made it up to stand on the crater rim by mid-morning, and then camped overnight amongst the glaciers in an awesome landscape. But it was incredibly cold at night – minus 17 degrees inside the tent! The next day we left at 4.30 am for the final push up onto the summit ridge, getting there just after dawn. Up at that altitude, there is an incredible sense of place. The light is crystal clear, the sky the deepest blue, the snow pure white, the glaciers sparkle bluish, and the atmosphere is very spiritual. And you can see Mt Meru rising above the clouds some 50 miles away. Two of our party unfortunately didn’t make it. They succumbed to acute mountain sickness and were emergency evacuated down the mountain, needing oxygen. But the rest of us made it to the top (Uhuru peak) – the highest point in Africa and top of the world’s largest free-standing mountain. For us, Father and Son, it was a wonderful and powerful experience. Absolutely worth all the planning, training and effort, and something we will never forget. We are not sure yet what we will do to cap Kilimanjaro as a follow up – but something for sure. And we have managed to raise over £1500 for our charities. We just want to say a big thank you to all of you who supported and encouraged us and donated to the charities. We know the children and Porters in Tanzania will benefit enormously from your generosity. 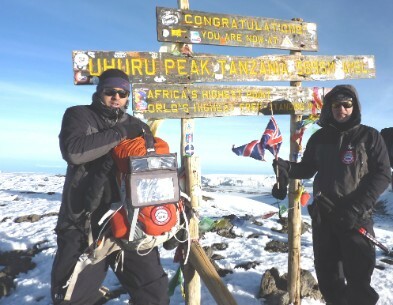 And in December 2010, Barry climbed Mt Meru for a second time, which proved to be just as tough and exhausting on the summit day. The trouble is that one ascends in three days: from 1500 to 1550m, then from 2500 to 3500m, and finally from 3500 to 4500m on the summit day. This provides very little time for acclimatisation in the upper reaches. It is recommended not to ascend by no more than 500m a day over 3000m. But the regular itinerary far exceeds this. Barry would recommend an extra rest day (before summiting) at Saddle camp (3500m) with some climbing to nearby ridges to acclimatise. You will enjoy the summit experience all the more. See the new pictures under "Meru Photos"
Click on photos above to see how it was, or open the powerpoint pdf file below which describes our journey in a host of photos and graphics.